Quality crafted by the Amish, each of our horse barns, storage sheds, garages and gazebos are built with attention to detail and craftsman’s pride – promising years of carefree use and enjoyment. We have a nice selection of storage sheds and modular garages IN STOCK NOW, but can build to order just about anything you can think of. Plus, our full line of hunting / camping / survival cabins, chicken coops, dog runs, garages, horse barns, gazebos, and storage sheds all have an extensive list of options for you to choose from. There’s really no need to “settle for less” when you can have exactly what you are looking for at Salem Structures. Also check out our Quality built Modular Cabins and Pre- Assembled Log Cabins each one built by Amish craftsmen. First you must select from one of the many residential upgrades we offer including Gazebos, Garages, Storage Sheds, Horse Barns and more. Next, you need to get your home or property ready for the new upgrades. Sometimes this involves making a level foundation pad from gravel or concrete. Once the paperwork is done and the building site is prepared we will deliver your new structure and put it where you want it with care being given to not damage your yard. Salem Structures is a family owned business committed to providing the highest quality Amish built backyard structures available today. Not only are we committed to quality but we also strive to have 100% customer satisfaction. Aaron Martin the owner has been involved in the outdoor storage structures since 1993. Salem Structures offers a complete line of storage buildings, garages, recreational log cabins, pre- assembled log cabins, Modular log cabins, portable horse barns, chicken coops, portable gazebos, playhouses, wooden and poly outdoor furniture, Pergolas pavilions and more. We have our own custom built trailers designed specially to deliver the prebuilt units to your location, Or we can built your structure on site for you if access is limited. We also offer shed moving or shed hauling with our custom built trailers we can move your shed to a new home. 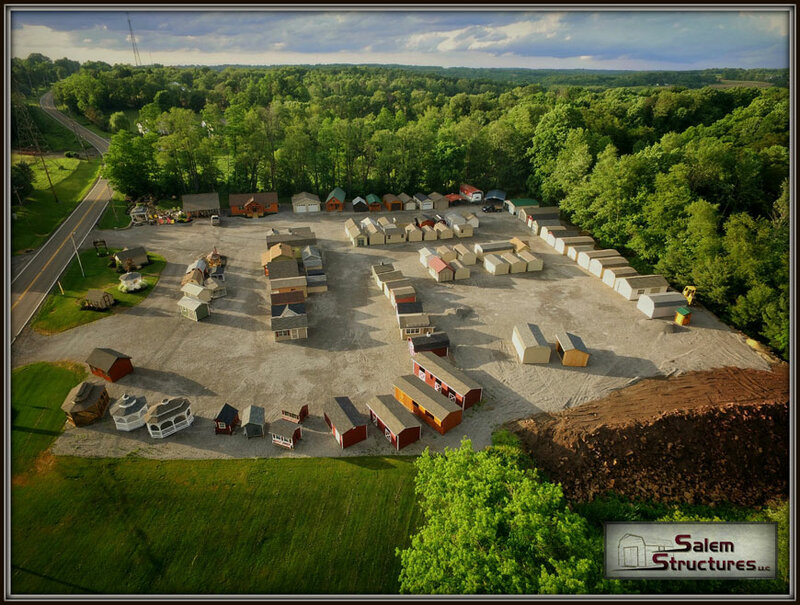 Our goal at Salem Structures is to Serve our customers with honesty and integrity.